The Presidents of the Church gallery at the Church History Museum allows visitors to see and interact with artifacts related to the presidents of The Church of Jesus Christ of Latter-day Saints. Visitors can increase their understanding of modern prophets, seers, and revelators through objects that offer glimpses into the contributions, impact, and personalities of these great men. Since the time of the Prophet Joseph Smith, members of the Church have revered the president of the Church as a prophet, seer, and revelator. Throughout their ministry, each president of the Church has had a unique impact on the growth and character of the Church. Though each prophet has the responsibility to “preside over the whole church…like unto Moses,” each has also had individual experiences and accomplishments unique to his ministry. The artifacts on exhibit in Presidents of the Church are objects, publications, photographs, portraits, and personal items associated with the ministries of these modern-day prophets of God. Brigham Young’s sunglasses, which were given him by Joseph G. S. Sanborn. 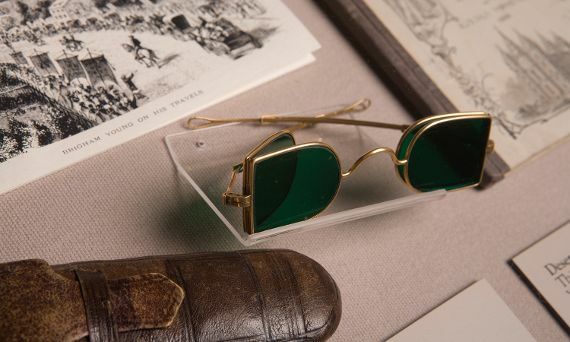 Brigham Young wore these green sunglasses with side flaps when traveling to visit settlements throughout the Utah Territory. Joseph F. Smith's copy of the Book of Mormon in Hawaiian. President Smith served two missions in Hawaii, the first beginning in 1854 at the age of 15. This book was given to the prophet in 1906. Gordon B. Hinckley's preliminary sketch of his new temple floor plan. During his administration, President Hinckley introduced a new concept to make temple worship as accessible as possible to Latter-day Saints throughout the world. His innovation was not just in size, but also in simplicity of operation and reduction of cost. In the October 1997 General Conference, Church members were electrified by his announcement of a goal to have at least 100 temples operating by the end of the year 2000—a goal that was met when the Boston Massachusetts Temple was dedicated in October 2000. President Hinckley made this sketch while in Mexico to meet with Church members.